Fishing around Anna Maria Island is holding steady to its wintertime pattern. That being said, you need to be flexible in your decisions on when, where and what to fish for. During the winter in Anna Maria, we can experience all spectrums of winter. During the cold fronts, our area is host to conditions such as raw, gusty winds and cold snaps down to the 40s. After the fronts, things can improve greatly with calm waters, light winds and warm temperatures reaching into the 80s. These conditions play a major role in what fish to target and where to target them. On the cold, windy days, offshore fishing is usually out of the question due to rough seas and less than favorable conditions. When this occurs, there is still fishing to be done. Fishing the sheltered inland waters such as the Intracoastal Waterway or the smaller bays north of the Manatee River is ideal. 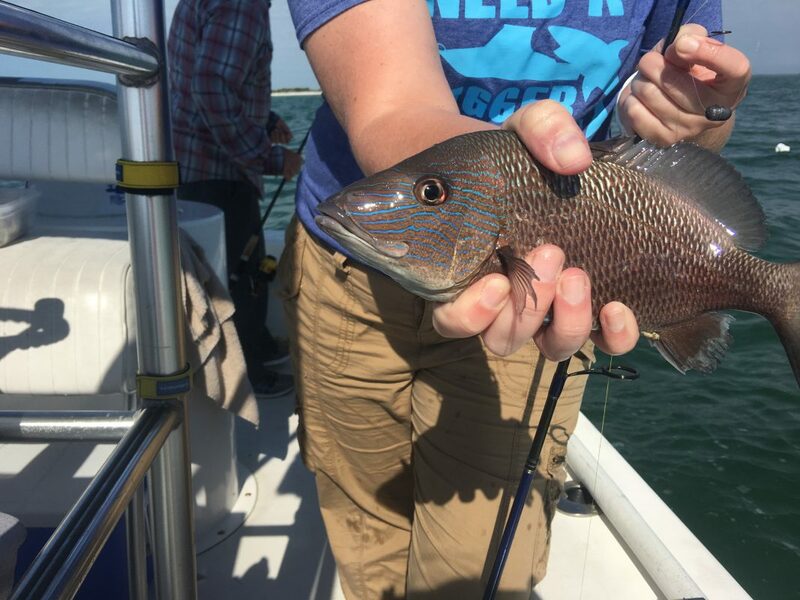 Using live shrimp as bait can yield numerous species including sheepshead, pompano, black drum and catch-and-release redfish. Trout fishing with soft plastics also is very productive over deep grass flats and in canals. On the days in between fronts, venturing out into the Gulf of Mexico can be quite fulfilling. Fishing nearshore ledges and reefs can be quite productive for a number of species including snappers, grunts, porgies, hogfish and grouper. If you’re out for enough time, you can encounter large fish such as amberjack and permit. Needless to say, there are always options when fishing around Anna Maria. You just need to keep an open mind and be happy with what mother nature presents to you. On my Southernaire excursions, I’m following this pattern. On the cold, windy days, I’m staying tucked up in the small bays, canals and in the ICW, which if providing great inshore action. Sheepshead are quite abundant which is a great “go to” fish to catch when conditions are slightly less favorable than normal. And what’s good about sheepies is the conditions don’t seem to bother them, which means they’ll still bite quite readily. Plus, they are one of the best tasting fish there is. I’m also seeing a great resurgence of redfish in the area. More so in the yeast years, anyway. Casting live shrimp to these catch-and-release is producing respectable numbers of hookups during a morning fishing trip. And, while targeting these reds, I’m seeing black drum and snapper take the bait. On the calm, sunny days, I’m venturing into the Gulf of Mexico. Fishing the ledges, reefs and wrecks is most to a number of species including snappers, Key West grunts, porgies, hogfish and numerous undersize grouper. This bite is typically great action as a bite occurs in almost every drop of the bait. Plus, you get some good eating fish to bring home for a fish fry.